CPC Driver Training Blog: More than 40 vehicles stopped during road checks . . .
More than 40 vehicles stopped during road checks . 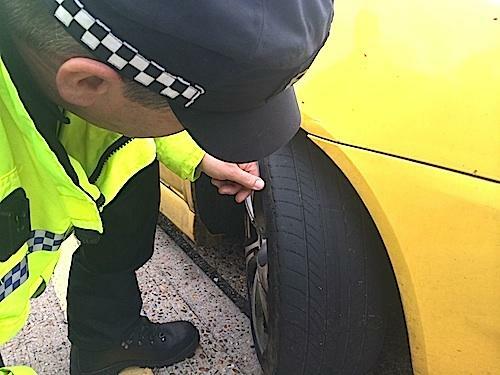 . .
More than 40 vehicles were stopped yesterday as police and partner agencies checked vehicles during an operation targeting criminals using Suffolk’s road network. The operation, conducted by Suffolk and Norfolk Roads Policing and Firearms Operation Unit (RPFOU), the Dog Section and Suffolk Special Constabulary, was held between 8am and 3.30pm yesterday, Wednesday 22 July. Using the Rougham Lorry Park in Bury St. Edmunds as a base, officers patrolled the main road networks and surrounding villages in the area with an aim of targeting and disrupting criminal activity. Whenever possible the trucks, light good vehicles and coaches that were stopped were then escorted to the site where partner agencies including the Driver and Vehicle Standards Agency (DVSA) and HM Revenue & Customs (HMRC) did additional checks and examinations. During the operation 44 vehicles were stopped in total, with just seven leaving the site clear of any offences. Nine of the vehicles were given immediate prohibitions by the DVSA, while eight were given delayed prohibitions – meaning defects needed to be fixed as quickly as possible. More than 50 advisory notices were given. Police gave 27 traffic offence reports for offences including driving with no seatbelt, driving with an insecure load, driving a vehicle in a dangerous condition, driving whilst using a mobile phone and driving with defective brakes or tyres. Two people were reported for summons, and reported to the Health and Safety Executive, over the transportation of a hazardous material and one vehicle owner was interviewed and reported for transporting an overweight load on a vehicle in a dangerous condition. All vehicles escorted to the site were tested for rebated fuel by HMRC, with a Vauxhall Vivaro found to contain pure red diesel and the driver fined over £500. Suffolk Police and Crime Commissioner Tim Passmore says: "Operations, such as Operation Mermaid staged in Rougham, clearly show how combining expertise and working together pays dividends for the people of Suffolk. "I have attended similar events to this in the past and seen first-hand the scale of these operations and it is extremely impressive.